2. Setting up and carrying out a pilot project that ties in with an initiative in Egypt, concerning an urbanization challenge. The project plans take a closer look at a social issue in a specific region or city in Egypt to which Dutch makers can make a contribution. In setting up and carrying out the projects, Dutch and Egyptian parties should work together on an equal footing. The Open Call has ended. Until the end of 2020, the Fund will be holding a number of open calls that relate to the challenges associated with urbanization in Egypt. The projects will deal with how these challenges, in a collaboration between Egyptian and Dutch partners, can be addressed in order to achieve more sustainable and inclusive cities. The question of urbanization provides opportunities for improving living conditions, housing, social cohesion and the utilization of technology for social innovation and for redefining cultural heritage. There are possibilities here for the exchange of knowledge and expertise between Dutch designers and cultural organizations in collaboration with Egyptian partners. How Egyptian and Dutch parties from the field of design can work on specific issues requires both exploratory work and projects that set an example. The role and involvement of local communities as full stakeholders in urban development is an important theme in both the Egyptian and Dutch design fields. One of the effects of projects and working methods that focus on this involvement is that they can lead to the meaningful transformation of the public space and the development of neighbourhoods. But also to the creation of awareness of aspects such as the value and potential transformation of (cultural) heritage, use or reuse of water and waste in the city. An additional aspect is the importance of reinforcing existing initiatives in Egypt that focus on urban issues with a strong social agenda. Examination of one or more urban phenomena and making this knowledge accessible and usable. The project forms could consist of various activities, such as workshops, a series of debates, hackathons, festivals or an urban lab on site. The activities should form a coherent whole, the project form should reinforce the content and vice versa, and they should lead to tangible results that are shared in both Egypt and the Netherlands. The Water issue and the reuse of water. This is a small selection from themes that are current in various places in Egypt. The project plans could tie in with these themes or explore a different issue that is endorsed from the Egyptian side. The projects could include an intervention, installation or study, in both the physical and virtual domain and they should tie in with an initiative or specific case on site where knowledge has already been developed and local Egyptian parties are involved. Which methods and forms of cross-disciplinary collaboration are desirable within the project? Which effects are the stakeholders involved aiming to achieve with the project and on what scale and within which timeframe will these effects materialize? How can the knowledge developed within the project about the Egyptian situation/context, in the area of urbanization or the chosen social theme, contribute to similar issues in the Netherlands? The applying party should be located in the Netherlands, operating in the Dutch creative industry field and registered with the Chamber of Commerce. In the event of selection, this party functions as the principal contractor for carrying out the project and concludes an agreement with the Fund for the implementation of the submitted project plan on behalf of all the Dutch and Egyptian coalition partners. Scaling up or deepening the collaboration between Dutch and Egyptian parties from a cultural perspective. A maximum budget of € 175,000 has been reserved for this Open Call. The support to selected projects is provided in two phases. In the first selection round, a maximum of 4 projects are selected. For the initial phase, a maximum amount of € 15,000 per project is available. The initial phase lasts for a period of 4 months at most, during which activities are carried out that include the generation of a comprehensive project plan for the second phase. The aim is to provide support to a maximum of 3 projects in the second phase. For the second phase, the remaining budget of € 175,000 minus the starting grants awarded is available. Description of the level and scale of the project implementation. A description of the disciplines and experts involved. Description of the organization(s) involved's experience with projects and collaborations related to the stated issue and working method. Communication plan, focusing on attracting a suitable audience, sharing of knowledge and experiences and sharing results. The expected effects of the project on the urban environment, the stakeholders involved, participating designers and the local community have been examined. All results of the project (both phase 1 and 2) should be publicly available in both countries and remain so. The selected projects will also be expected to participate in interim activities focusing on the sharing of experiences and the process, organized by the Fund. A balanced distribution of the budget between the Dutch and Egyptian partners. The Fund is advised by the Dutch Embassy in Cairo concerning the collaboration between Dutch and Egyptian parties within the proposed coalition. The evaluation takes the form of a tender. This means that a number of projects are selected in preference to other submissions, and the project plans that are not selected do not receive any individual explanation from the Fund. The Fund contacts the selected projects. The selection is made known by e-mail within 6 weeks of the closing date. Encouraging an inclusive and equal approach to issues, collaborations and exchanges. The project plan can be submitted from January 1st until 7 March 2018 via the Creative Industries Fund NL's online application environment. 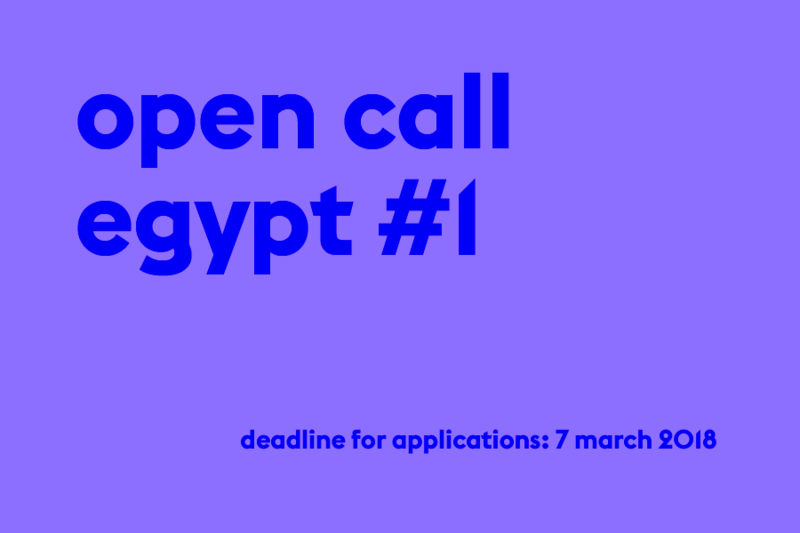 From January 1st you can select the 'Open Call Egypt #1' round. 1. A concise and coherent project plan that covers the points mentioned above. 2. The budget and planning must not exceed 2 pages and indicate what is to be investigated and elaborated during the initial phase and the subsequent phase. A cultural tariff should be utilized that does not exceed € 65 per hour exclusive of VAT. 3. CVs of parties involved, not exceeding 2 pages in total. 4. Proof of registration with a Dutch Chamber of Commerce (Kamer van Koophandel), not more than 1 year old. 5. Representative image for communication purposes by the Fund. The Subsidy Regulations specify which costs are excluded from financing by the Fund. The project plan is a PDF file in A4 format and does not exceed 10 pages (excluding planning, budget, CVs, images and proof of registration Dutch Chamber of Commerce). The file size does not exceed 10 MB in total. If the submission does not comply with the description above, no evaluation of the content can take place. Request your login details for the online application environment in good time and familiarize yourself with the application form. Validation of a new user account takes 1 working day at most. You can't present a concept project plan to the Fund, but you may ask for advice during the preparations until 27 February 2018 at the latest. You will receive confirmation of receipt by e-mail one week after the closing date at the latest. The Fund is organizing a meeting for interested parties on 15 February 2018, in The Netherlands. If you would like to receive an invitation, please send an e-mail to internationaal@stimuleringsfonds.nl stating 'Meeting Open Call Egypt #1'. For questions about the Open Call and the procedure, please telephone or send an e-mail to Zineb Seghrouchni at z.seghrouchni@stimuleringsfonds.nl or Anselm van Sintfiet at a.vansintfiet@stimuleringsfonds.nl. This Open Call has its legal basis in the Subsidy Regulations of the Creative Industries Fund NL. The Creative Industries Fund NL is conducting a four-year programme within the policy framework of the International Culture Policy 2017-2020 (objective 2) with funding from the Ministry of Foreign Affairs, entitled 'Sustainable and inclusive cities through design'. Central to the programme is the role and deployment of design and design thinking to question and provide solutions for rapid urbanization and the corresponding social themes. Cross-disciplinary working with relevant stakeholders in Egypt is encouraged, both within and beyond the design disciplines, where it revolves around providing opportunities for collaboration between Egypt and the Netherlands on an equal footing and strengthening the trust and understanding between the two countries.